You’re already a strong student and capable of producing high-level English writing, but with exam and paper-writing time, and deadlines fast approaching, additional support and an extra push always help on the path to success. Using the best writing software can make the difference between a B and A paper, so trust WhiteSmoke to keep you on top. Academic writing often takes the form of college essay writing, but comes in many styles. You may need to write a medical lab report for a biology course, a paper for a class in the legal department, a business proposal for another course, or an essay or term paper for a humanities class. No matter the style of your writing, WhiteSmoke will help you improve the quality. With access to a number of editing features in one convenient software package, when you use WhiteSmoke English writing software, you will see positive results. Whenever you write a college essay or another academic paper, use WhiteSmoke for the ultimate in proofreading. In just one click from whichever application you are working from, you will benefit from a thorough spell check. In addition, you can check your English grammar, whether you are an ESL student or a native English speaker who might have glossed over an error. Don’t forget to use our punctuation check to make sure you are conveying the idea you intend; even a misplaced comma can change the meaning of your sentence. 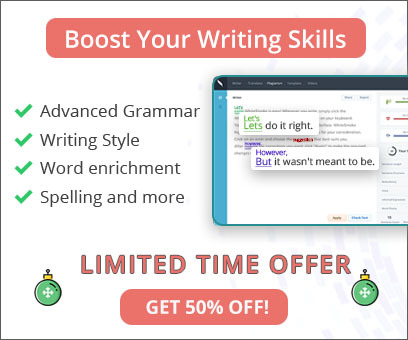 Besides completing these standard yet essential proofreading tasks with WhiteSmoke’s help, be sure you enhance your essay using our innovative enrichment feature. When you click on the enrichment button, our artificial intelligence server instantly analyzes your entire text, and then offers you relevant, context-based suggestions of synonyms, adverbs, and adjectives. Such additions to your document will raise the level of your writing and impress your professors. You can also check definitions and find related parts of speech to searched words in our online dictionary for accurate vocabulary use. And now, you can have the word translated into 17 languages with our newest dictionary feature. Save valuable time while writing your college essays when you use this comprehensive writing solution. 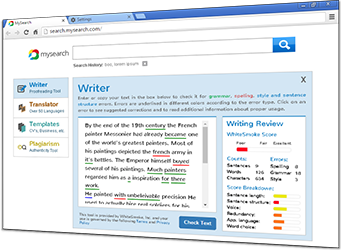 WhiteSmoke writing software provides every writer with necessary proofreading tools, plus revolutionary enrichment and dictionary features. Improve your academic writing today, and succeed with your education.